Kazakhstan has pledged to support the territorial integrity of Ukraine and called for a peaceful settlement of the Donbas conflict. 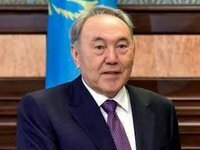 "I am asking Russia and Ukraine to think about a compromise in order to end this conflict and preserve the territorial integrity of Ukraine, because this situation [the Donbas conflict] is nonsense and it should not have happened," Kazakh President Nursultan Nazarbayev said after his negotiations with Ukrainian President Petro Poroshenko in Kyiv on Monday. He said the confrontation and sanctions "were a road to an impasse and a path to nowhere." The Ukrainian and Kazakh presidents confirmed the importance of the Minsk agreements for the peace process.